Onions and I have a love-hate relationship. On the one hand, they add wonderful flavor and aroma to almost anything. And the smell of caramelized onions is arguably one of the best smells to come out of my kitchen. On the other hand, they always make me cry. Always. After cutting up an onion, I look like I’ve just been bawling my eyes out. I’ve tried pretty much everything I can think of to keep the tears at bay. From chewing gum, to chilling the onions, (although I still can’t bring myself to wear those silly onion goggles) and I still end up with raccoon eyes. As a result, I’m sure you can imagine that cutting up a couple of onions is not one of my favorite activities. 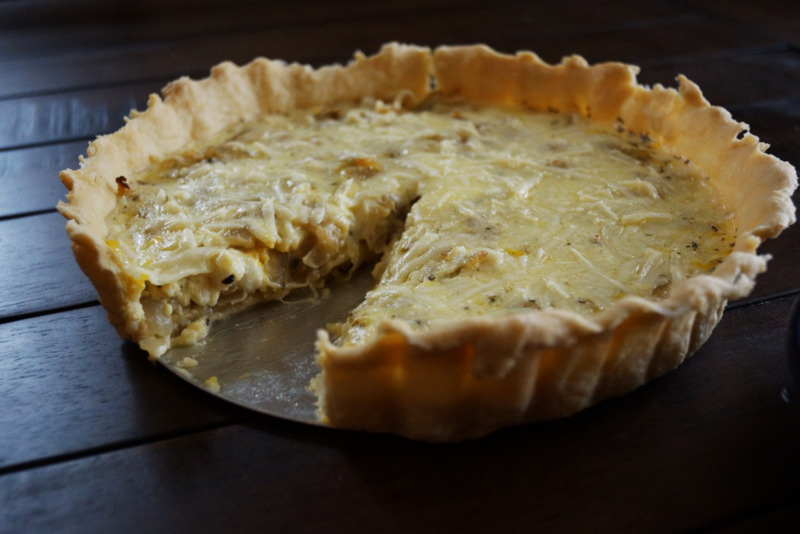 But I can also tell you that in the case of this caramelized onion and fennel tart, it’s totally worth it. Caramelizing the onions low and slow with thinly sliced fennel creates a wonderful aroma sure to forgive their earlier tearjerking tendencies. And that’s just the beginning. Suspend these caramelized beauties in custard, top them with aged parmesan and bake them into a flaky crust, and you just may forget they ever made you cry. This tart is the kind of thing I think is perfect to make on a chilly winter day. And it utilizes many kitchen staples, so odds are you probably have most of the necessary ingredients (eggs, onions, flour, butter, milk) on hand at any given time. Serve with a salad and a glass of wine, and you have one tasty meal. And don’t forget to look here for more in-depth information on pie crust making. Bon Appetit! 2. Heat the olive oil in a pan over medium low heat for about 2 minutes. Add the thinly sliced onion and fennel and reduce heat to low. Slowly cook onion/fennel mixture stirring every couple of minutes until the mixture caramelizes and reduces down, about 30-40 min. 3. Once onions and fennel are a nice caramelly light brown, remove them from the pan and place in a layer on the bottom of the crust. 4. Whisk the eggs, milk cream, thyme, salt and pepper together until nice and smooth. Pour over fennel/onion mixture in piecrust. Sprinkle cheese over top. 5. Bake for 30-35 min until filling is set and puffed. Serve hot or at room temperature. 1. Measure the flour into a large bowl. 2. Being careful to handle the butter as little as possible (we need to keep it cold, and body heat will warm it up), cut the butter into small pieces, then add to the flour. 3. Using your hands, work the butter into the flour until the pieces are small (about the size of a pea) and the mixture has a grainy texture. 4. Add the salt and the water (very cold) a little bit at a time, mixing until the dough is all incorporated into a ball. If 1 oz of water doesn’t seem to be enough, you can add a bit more, but add it a little bit at a time, and use the least amount of water possible to hold the dough together. 5. Flatten the dough into a disc, wrap in plastic and refrigerate for at least 15-20 minutes before working with it further. 6. Once the dough has been chilled, roll it out and shape it into your greased pie or tart pan, and preheat your oven to 325 degrees. 7. For blind baking (baking just the crust with no filling), you will need to weight down the crust so it doesn’t bubble and form air pockets while it’s baking. You can buy pie weights, but I just cover the crust with Al foil and throw in some dry beans or rice. Once the pie has baked at 325 for about 20 min, you can remove the foil and beans (or what have you) and continue to bake for about another 15 minutes to get a good brown on the crust. 8. Remove the crust from the oven, cool and fill according to recipe instructions.